If you’re an SEO reading this, the point of this article is to communicate this: businesses should hire an SEO consultant/agency to help them out with the full research, guidance around writing things that rank, and promotion. SEOs don’t just insert keywords into articles that are already written. We have the industry knowledge, but we need someone to insert the SEO keywords into the articles. When I hear this I cringe, but it’s understandable. SEO can seem like some magical voodoo that someone on the internet does that all of a sudden gets you a ton of traffic and your business explodes in revenue and you retire early. Unfortunately, this isn’t how SEO works. It comes down to a fundamental misunderstanding of how SEO works. It’s a typical chicken and egg problem – which came first, the knowledge or the topics/keywords? Back in the early 2000s, search engines were stupid. They had no way to know what keywords really meant, but only that they existed. As a result, in the SEO world there became the concept of “keyword density”, which many people practicing SEO used to determine if their page was properly optimized around a specific keyword. Floating text off the screen, once again only visible to search engines in the code but not to users. As you can tell, these tactics were used to try to game the search engines but added absolutely zero value to the end user. In fact, content that was subpar often ended up ranking over better content because the person “optimizing” the page had better or more tricks up their sleeves. The search engines found out about these tricks, and for a long time it felt like the search engines and SEO practitioners were in a game of whack-a-mole. The SEO community would find a new trick that worked (“Ooh, float white text off the screen and it helps!”), the search engines would find out about it and either punish it or devalue it, then the SEO industry would move on the next trick. Mole, get whacked, pop up again, repeat. In the last six to seven years however, the search engines have stopped whacking the moles and instead changed the game. And a lot of people in the SEO industry have kept playing checkers while the search engines are playing chess. A lot of people in the SEO industry have kept playing checkers while the search engines are playing chess. 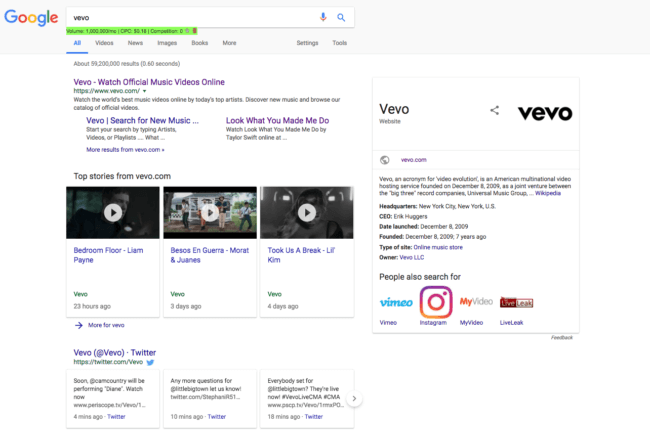 In the above, Vevo is an entity to Google. In the years since, the search engines seem to have started using at its core something like the tf*idf which “reflect how important a word is to a document in a collection or corpus”, according to Wikipedia. That’s a fancy way of saying that the search engines are no longer just looking at specific keywords like “SEO consultant’ and how often they are used and match up to other elements on the page (though these things are absolutely still important). Search engines now know that other terms being used tend to correlate to a more relevant page and better experience for searchers, so they not only look at “SEO” for example but also like to rank pages mentioning SEO better when they also mention things like “content”, “links”, “consultants”, and “Rand Fishkin”. This is just an example, but you see where I am going with this. Google has long wanted to reward great content, and I would say that they are finally making great strides in that direction. Certain elements on a page that the SEO industry has found to correlate to better rankings, such as lists and images and blockquotes, are now being used by the search engines in other ways to try to give better results to searchers. We’ll get to that in a minute, but let’s back up quickly and look at an example of Google rewarding in-depth content with a lot of semantically related terms instead of “properly” optimized content. Six years ago, the common SEO advice to clients was to put their main keywords in the front of their title tag, in the URL, in their H1 on the page, in their meta description, and a few times throughout the article. Sounds a lot like “SEO keywords” and “keyword density”, doesn’t it? If you look at those two, you definitely still see elements of that old advice, which means that it still works to an extent. But is it enough? 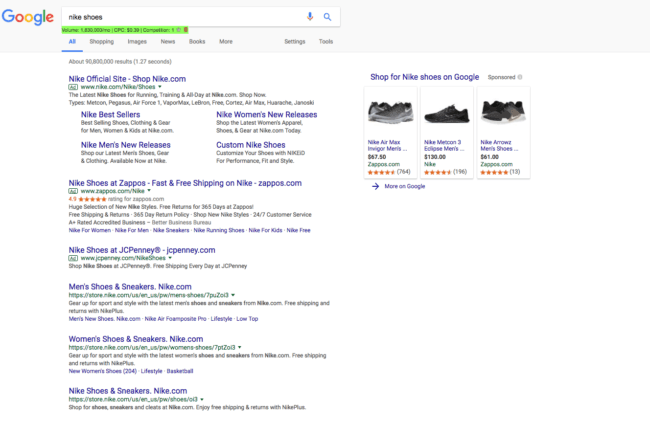 If you look at the Nike example, the first three results are for nike.com! Their brand trumps all, and good luck getting traffic for that broad branded keyword if you are not Nike.com. The next one is for a pair of skis. At the very top are product ads, but right below that are content sites. I’m not trying to humblebrag here, but that first result is my side project (and yes does rank #1 logged out) and that article is 2,000 words of original content and photos. 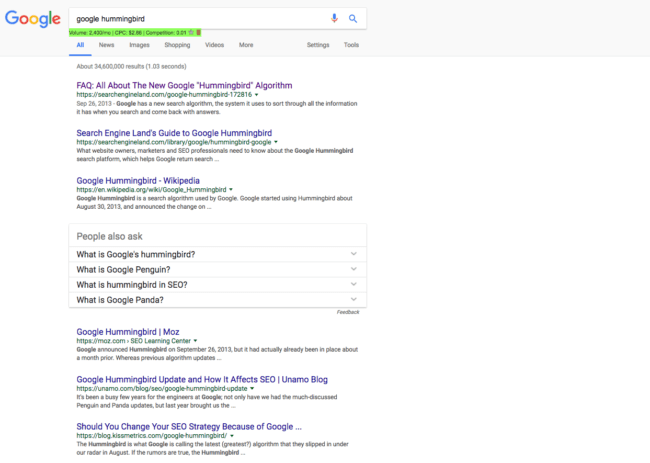 Search for an SEO industry related term and you see articles ranking that don’t have the target keyword of [google hummingbird] anywhere near the beginning of the title! And with the advent of answer boxes in a lot of informational queries, search engines are rewarding well-structured writing that gives the answers that people are searching for. When someone comes to me wanting to find a consultant to help them with inserting keywords into the content they are writing, I gently help them understand that the days of doing some “SEO tricks” to get content and pages ranking better are long gone and you have to work within the system now to really see the benefits of an SEO investment. My advice to those looking to hire someone to help them with their SEO is to not treat SEO as something you do after the fact, but rather as a system that needs to be evangelized throughout your organization. You can’t just write content and then have someone insert some keywords into it. You actually need the expertise around the topic to write eloquently and naturally about it, because this is what the search engines want. To cover the content in-depth. Brian Dean’s study in 2016 shows that the average #1 ranking for the keywords they studied (over 1 million search results) is 1,890 words according to SEMrush. The days of 500 word blog posts actually ranking and driving traffic that makes a difference and converts into paying customers is long over. It doesn’t work anymore, so stop paying someone $200 a month to write you four blog posts a month. Well, how much does it take to cover the topic completely? That’s how long your content needs to be – long enough to cover the topic in-depth and be the best piece of content on the internet about that topic. So which is first, the research or the expertise? Where do you start, with the expertise on the topic or with keyword research? 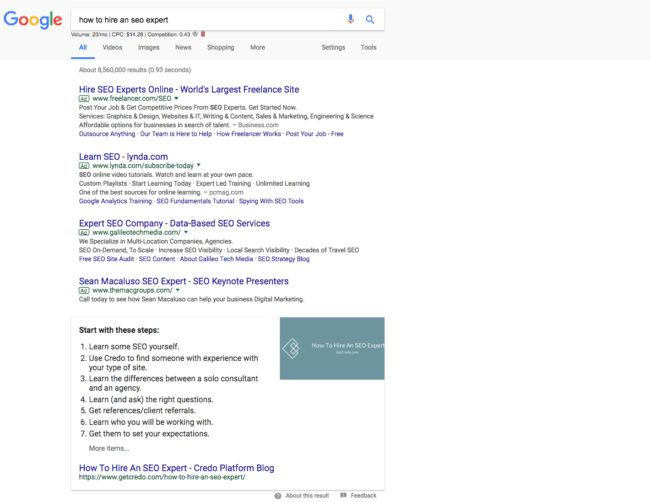 My answer is that to win in the search results (SERPs) these days, you need to be an authority and expert on the topics on which you are writing. This does not mean that you do not ever have to do research in order to write the best piece of content, but it does mean that you cannot just farm out any content to be written on your site to any old “content writer”. You need someone with expertise in the topics in which you are investing. Once you have the expertise on board, or you are the expert that can then figure out how to get that content written without you spending all of your precious time doing it, then you need to do the keyword research to identify the high-traffic terms that people are searching around your business. We’ve just discussed how you or someone in your company (or at your agency) needs to be a subject matter expert in order to actually rank in the search results these days. Keyword research will then be much more fruitful because you can identify the keywords and topics that you need to write about in order to get the traffic to your site to then convert into users. Keyword research comes in from the very beginning so that you can map out your content and systematically create the pages and posts and resources that will meet the searcher, and your potential customer’s, needs. SEO isn’t easy, but it is also very learnable. It is a system that you can learn and execute within and see repeatable and dependable growth and results as long as you take the needed action and apply the tactics and strategies that you learn. Start with becoming an expert, layer on proper keyword research and topic discovery and development, and then go execute and dominate your niche. Thanks for the article. Does this mean that Yoast is virtually useless? Yoast SEO is absolutely useful because they do way more than helping you with content optimization. 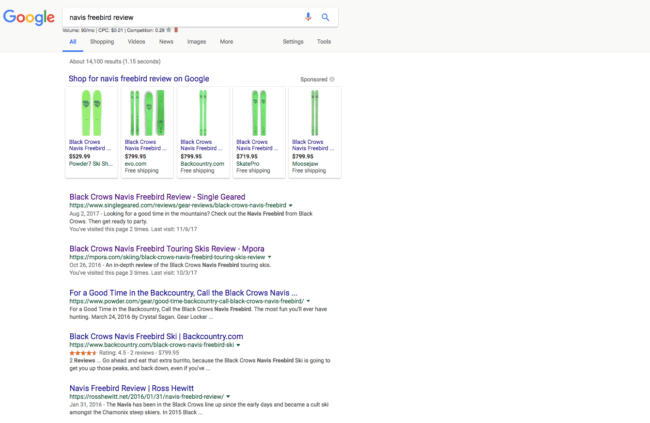 Not only does Yoast do a lot more than keywords, it does help you write a good title and meta description which google still does use (sometimes). It really important to write an awesome title and meta description not because Google ranks it higher but because it will lead to more people clicking on it. Thanks Tyler! I haven’t done much around that though I do know that tools like Ryte (formerly OnPage) have it baked in. Love this! I’ve been trying to learn more Seo and digging into research in ahrefs and search console and really enjoy it. I feel like there is a lot of pressure from businesses to be able to show results from these types of things very quickly, which I’m not sure is realistic? However I’m not an seo expert so not sure what is typical. I’ve read different case studies on this but would love to see a future post on this! Now I’m off to read the keyword research post! Just got clickbaited. Practice What You Preach my friend. This is a hell of a lot of words to say very little – typical old-school content marketing. And I’ll bet my I teeth it any negative comments don’t make it onto your blog. Again that’s an old school Anachronism. Today is Web 2.0 should always see opposing opinion and comment as an opportunity. I’m just approving this to show that I do value feedback. If you work in SEO, then this article wasn’t addressed to you. Also, Web 2.0 was early to mid 2000s. We’re well past that now. It’s time for you to stop playing checkers while the rest of us are playing chess. The comment thou made is the only instance of anachronism in this post. Thou are confusing what John is saying. Everything he touched on is essential. Thee believes that content marketing is the same thing it was when people used Web 2.0? I have never heard anyone refer to RankBrain as Web 2.0. One would hope thee will agree that the web is continually changing. What John has written is very useful to the majority of people on the internet who are not familiar with the best way to write content. It is not at all outdated. Look up “What is Google RankBrain?” “The effects of artificial intelligence on SEO” “More than Keywords: 7 Concepts of Advanced On-Page SEO” “US patent number US7996379” & in case you think I am a moron please feel free to put my name into a patent search. We still live in a where some think it is correct to place whatever they want to rank for in their content with either one or multiple keywords to rank well. It hurts your website’s credibility. AI capable of extracting what a human being is saying in a very similar fashion to the way a human being does you don’t have to use the word “car” all over a page to talk about an automobile & Google understands that. I would love to hear what you consider to be not practicing what somebody preaches because both this article and the interview with Rand Fishkin yesterday are genuinely exquisite pieces. Furthermore, John’s article is a transcription of the conversation; he had with Rand, so it is 100% human voice no keyword’s shoved in there for ranking. Showing us context is something Google looks for not just keywords. Sorry for the rant I do not understand why you would slam something that is extremely valuable the furthest thing from being outdated. Please place your teeth in a box before shipping, and I excuse my use of old English. I really should put upvoting/downvoting on comments on this site, because this comment deserves a ton of upvotes. Thank you very much for your article. A few days ago I was talking about this in my blog. Not only must we enter keywords, we must make content integrated into our global strategy. Thank you. Hola Raul, I would actually change what you said to say that we are not entering keywords into anything, but integrating our keyword strategy into our broader strategy. Thanks for caring and sharing. It is so much easier for me just to write content without worrying about SEO. I appreciate that is appropriate. Hi Judy, that’s not at all what I was saying. It sounds like you’re actually doing what I’m saying not to do – write content and then try to layer on SEO later. Instead, you need to do the research ahead of time to find the topics people are searching for then write naturally while taking into account the terms you are trying to rank for. I started a blog for my newest business a couple years ago simply because someone said I simply “must” have one for my site. I really didn’t feel like writing for it though, so would just occasionally get inspired to put something up. Then at one point I decided to start doing webinars and whoa, did I set myself up for a ridiculous amount of research and testing. I went through trials of so many different types of webinar software, even doing actual webinars with a few. After I was done, I was haggard. And was inspired to write up the entire experience to save others the hell I’d been through. And that’s pretty much the tone of the entire 3000 work piece. Well wouldn’t you know, that’s the one article on that site that generates all search engine traffic. Often it is for names of some products I review that are in the title, but often it is for what to me seem like random words throughout. I do know some SEO, and did use SEO practices in all my other articles, but none of them rank. This one I wrote with only a thought of SEO in header tags, the description and image alt tags, and not going after one keyword. I simply put relevant words for the topic in those places. Basically, it’s simply a well-written, comprehensive article on the topic because I really knew what I was talking about and thorough enough to give people actionable info. I wound up with almost 300 comments on that article, including some from the makers of the software. I did nothing to build backlinks, but two years later I still get traffic for that article (though suddenly a LOT less as of about a month ago… not sure what happened there). I say all of this to elucidate the points being made in this article. While I probably could have thought more about SEO from the start, I knew enough to include it in key places as I wrote the article. And I definitely included lots of related terms that formed a web of seo relevance on the topic. And it was long. I paid attention to things like title and description length. And both people and search engines liked it. Not sure how I got away with having no backlinks, or at least none I was responsible for being out there. Maybe that’s what caused Google to smite me about a month ago, if Google increased the priority of that in October. Thanks for confirming what I was piecing together from that experience, but hadn’t completely clarified. This really helps clarify what to duplicate from that experience going forward.